Anchorage hotel workers are celebrating after a federal judge issued a preliminary injunction against Remington Hospitality, the Texas-based operator of the city’s Sheraton Hotel. The injunction comes after a three-year legal battle. It requires the Sheraton take steps to restore the terms and conditions of employment as they existed prior to the hotel’s decision to stop union negotiations in 2009. Fay Gavin, a banquet server with 24 years with the Sheraton says she joined the lawsuit after management started doing things like cutting lunch breaks, increasing workload and giving away hours to temp workers. The injunction, she says, is a step in the right direction. The Sheraton Anchorage Hotel’s Texas-based owners have been ordered to recognize union contracts and bargain with the union representing hospitality workers at the hotel. U.S. District Court Judge Timothy Burgess’s 34-page injunction was issued late Friday. Among other items, it includes provisions requiring Remington Lodging and Hospitality to restore paid lunch breaks and employer-paid health care and reduce housekeepers’ daily quota of cleaned rooms. 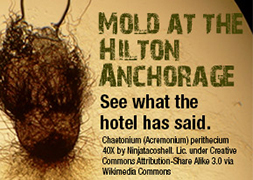 On February 3, 2012 a federal judge issued a preliminary injunction against Remington Hospitality, the Texas based operator of the Sheraton hotel in Anchorage. This injunction comes over five months after a National Labor Relations Board (NLRB) Administrative Law Judge concluded that the hotel violated numerous federal labor laws in its effort to end recognition of its workers’ union, UNITE HERE Local 878. Court ordered injunctions against employers are rare and are typically issued to prevent employees from suffering irreparable harm while NLRB decisions or appeals are pending. In this case, because of the quantity and seriousness of unfair labor practices committed by the hotel, the injunction will require the Sheraton to take numerous steps to remedy past unlawful conduct against its employees. Furthermore, it will require the hotel to restore the terms and conditions of employment as they existed prior to the hotel’s unlawful declaration of impasse in past union negotiations. These terms and conditions include (but are not limited to) a reduction of workloads in the Housekeeping department, restoration of the employer-paid union medical insurance plan, recognition of the workers union and resumption of union negotiations. “The actions of the court demonstrate that the Lord hears the cry of the oppressed for justice, so our legal system can still attend to the people’s cry for justice. [These] wealthy corporations, with their stables of well-paid lawyers, cannot defeat a people united in their demand for respect and fairness,” said Pastor Glenn Peterson from Central Lutheran Church; one of many community leaders that has maintained his support of the workers throughout the last three years. The injunction comes after three years of struggle by Sheraton workers to protect their benefits, their working conditions and their union from the employer’s egregious assaults. To date, the struggle has been marked by the filing of over 40 unfair labor practice charges against Sheraton management, a lengthy NLRB hearing, two meritless lawsuits filed by the hotel (one against the Union, one against the NLRB itself), an ongoing boycott, frequent picket lines and an overwhelming amount of Anchorage community support. Local 878 represents over 1,400 hospitality workers across the state of Alaska. A U.S. District Court judge has ordered the Sheraton Hotel in Anchorage, Alaska to recognize and bargain with its employees’ union representative of over thirty years after two years of increasingly tense relations that included a host of egregious unfair labor practice conduct by the Hotel, including its suspensionand discharge of Union supporters, unilateral changes in the employees’ terms and conditions of employment, prematurely declaring impasse in negotiations, and ultimately withdrawing recognition of the Union. The preliminary injunction granted today by Judge Timothy M. Burgess will remain in effect until the NLRB’s administrative process is complete. Judge Burgess found that the NLRB was likely to prevail in its continued proceedings against the hotel, and that failing to issue an injunction at this point could cause irreparable harm to the employees and the public interest. On December 9, 2011 the National Labor Relations Board (NLRB) announced that it had filed a lawsuit against the Sheraton Anchorage. In the lawsuit, the NLRB stated its case for the immediate need from the court for a preliminary injunction that would require the Sheraton to stop violating federal labor laws. The current date for the hearing is January 26, 2012 at 1pm. The location is at the New Federal Building in downtown Anchorage, Courtroom 1 (see map below). ANCHORAGE, Alaska – The National Labor Relations Board has filed a lawsuit in federal court, accusing the Texas owners of the Sheraton Anchorage of unfair labor practices. The lawsuit seeks an injunction preventing Remington Lodging and Hospitality from such practices and to resume negotiations with the union representing about 160 employees. On December 9, 2011, the National Labor Relations Board (NLRB), the agency that enforces the National Labor Relations Act, the federal labor law that governs most private-sector workers, filed a lawsuit in an Alaskan federal court against Texas-based Remington Lodging & Hospitality, the corporation that operates the Sheraton Hotel & Spa in Anchorage. The lawsuit stems from a long-running dispute between the Sheraton and its workers’ union, UNITE HERE Local 878. The lawsuit will be heard by Honorable Timothy Burgess in Anchorage Federal Courtroom 1 on December 29, 2011 at 1:30pm. In its lawsuit, the NLRB asks the court to issue a preliminary injunction against the Sheraton that would require the hotel to stop violating federal labor laws and resume recognition of, and negotiations with, Local 878. This lawsuit comes less than four months after an NLRB Administrative Law Judge concluded after a 40-day hearing that the Sheraton acted unlawfully in its campaign to break the workers’ union. If the federal court grants the injunction, the hotel will be required to return working conditions to the standards established by the long-standing union contract at the hotel. Return to these standards will be a milestone victory for the hotel’s hourly workers. They include, among other things, the reduction of workloads for housekeepers, restoration of the pre-existing (and more affordable) union medical insurance plan and resumed participation in the union pension plan. The injunction will also compel the hotel to take numerous other steps to remedy past unlawful threats and discipline imposed by the hotel against its employees. Since 2009, Sheraton workers have been struggling to protect their benefits, their working conditions and their union from the employer’s egregious assaults. To date, this high-profile labor dispute has been marked by the filing of over 40 unfair labor practice charges, a lengthy NLRB hearing, two meritless lawsuits filed by the hotel (one against the Union, one against the NLRB itself), an ongoing boycott, frequent picket lines and an overwhelming amount of Anchorage community support. While workers feel optimistic about the injunction and the prospect of returning to the bargaining table, they want to remind the public that their struggle is not over and that they continue to ask the community to boycott the Sheraton until the dispute is resolved. November 4, 2011 – Activists from Occupy Anchorage joined dozens of hotel workers and community supporters on the picket line outside the Sheraton Anchorage hotel. They stood together to remind greedy corporations, like the Texas based 1%ers that own and operate the Sheraton, that the 99% will not tolerate abuses of workers rights in Alaska. Recently, an Administrative Law Judge with the National Labor Relations Board found that Sheraton managers had unlawfully coerced, threatened and terminated union activists. Furthermore, the Judge found that Sheraton management unlawfully stopped recognizing the workers’ union at the hotel. While Sheraton management attempts to appeal the judge’s decision, workers continue their struggle to restore fair working conditions and their union rights. Workers continue to ask the public to boycott their hotel and to date, dozens of Alaskan organizations have supported their requests by moving their business from the Sheraton to other Anchorage area hotels. Several speakers focused on the boycott of the Sheraton and Hilton, including Native Rights activist Desa Jacobbson. “That is no way for an Alaskan worker to be treated, and Alaska will not stand for it because it’s uncivilized,” Jacobbson said.